The morning of my October 11th 2014 was not terribly pleasant for me. On top of poor sleep and surprise assignments with unreasonable deadlines, The senseless slaughter of hundreds of thousands of innocent civilians in Monaco, Spain was weighing on my conscience due to my strategic mistake not upgrading my airforce soon enough to be able to catch the new, faster alien spaceships. All this extra work and violent horror was a bit of a drag. Then Alice presented lunch to me. My theme this birthday has been the gluten-free reimaginings of glutinous classics. For lunch Alice made me reimagined sloppy joes. 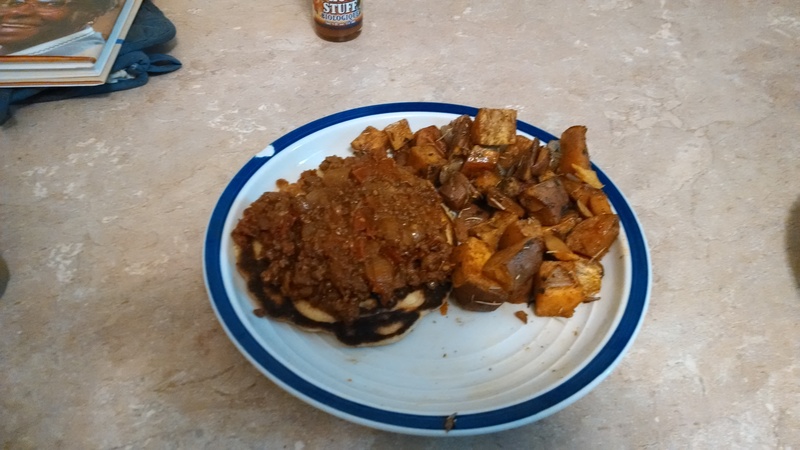 That is, sloppy joe filling on a cornmeal pancake. I called the new concoction “Pancake Joe,” making the whole thing sound vaguely military and saturday-morning-cartoonish. The roasted sweet potatoes are for the purpose of using up extra vegetables in the house, a secondary theme of my birthday. We received these sweet potatoes from one of Alice’s lab mates, who had removed a small core from each to study and had no use for the rest. Occasionally I had a potato with a small cylinder removed, but that made things even more fun. All lunch items were delicious, and they were delivered with such charm and care that I couldn’t possibly remain grumpy. And I hadn’t even had dinner yet. Before dinner, my sister called me. Despite my attempts to monopolize the conversation and prevent her, she eventually managed to wish me a happy birthday. Then I told her I hoped to live to eighty-eight years old to see the United States’ 300th anniversary. I can decide then if the US ended up the land of the free and the home of justice that it always aspired to be, or if the great experiment ended up yielding just another big, corrupt country like China and Russia. Rachel said when she was 86 she would talk with me about whether we thought America turned out all right, and she also wanted to discuss whether Harry Potter was still beloved in 2076. I told her I’d write down that I was going to do this in my blog, because if anything is still around in 2076 it will be my blog. Always updating once a week, as long as I have a brain to think and fingers to type. Greg called as well. First he called when I was grumpy, and I told him how grumpy I was and the conversation just ended there. Then I called him back when I was feeling better, and he asked me what I wanted for my birthday. I told him that he should make me something creative as always. Jimmy texted me with a generic happy birthday message, and I said “oh no you don’t, you have to say more than that.” He was all like, “I don’t have time.” Then later in the day he managed to find a small window and called me, but after one ring the phone stopped ringing. It turned out that just at the brief moment when he was able to speak to me his phone was failing him. 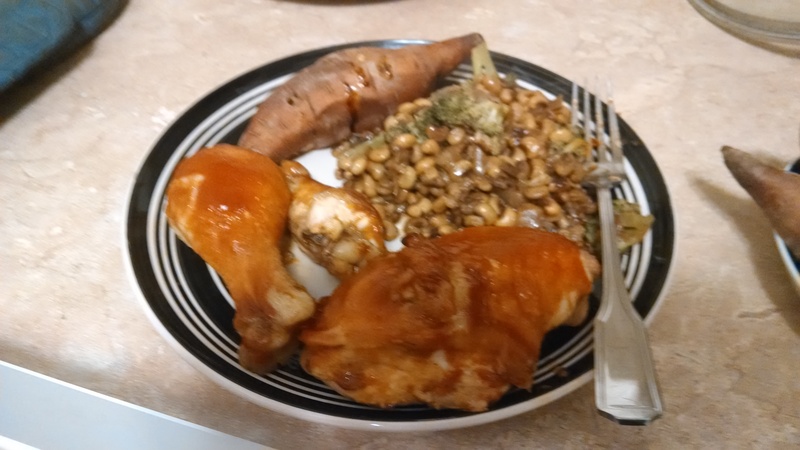 Barbecue chicken, baked sweet potatoes, and fresh beans and broccoli. No gluten-free reimaginings here, but that’s because it is all gluten free in its original imagining, and all delicious. Finally, shortly before the evening’s close, who managed to get his phone to work but Jimmy? I told him about how I was planning to visit with Rachel at age 88 and evaluate how Harry Potter had aged, and he said it would be funny if by that time neither of us had any memory of what Harry Potter was. That would certainly be an indication of how well it had aged. The next day my mother took a shot at the Gluten-Free Challenge. She cooked some fettucini alfredo with gluten-free spaghetti, making it really “spaghetti alfredo,” but I wasn’t going to split hairs. It was so good I had already eaten seconds before I realized I’d forgotten to take a picture. Between lunch and dinner Greg sent me an email top 20 list of the favorite things he remembered me doing, written like a historical timeline complete with years and “circa” years for when he didn’t remember exactly when they happened. I’ll just share one of these. I particularly like this one because it makes me seem like some kind of comics visionary, and I like being represented in such a way. When dinner did come, I did not forget to capture it. Mom constructed orange chicken from scratch. It was a bit of a cheat because I hadn’t realized orange chicken called for corn starch instead of breading and was therefore already gluten free, but that was no problem, as it was the best orange chicken I’d ever tasted. Really, the orange chicken at Chinese 35 buffet was just fat and salt that pleased me as a ten-year-old, but this orange chicken was tangy and sweet and had just exactly the right texture. The vegetables were also delicious. I forgot to take a picture again, and the leftovers are not terribly photogenic, but the cheesecake was also delicious. I would like to personally thank my father for doing all the dishes, even though he insists on saying “you’re welcome” when the proper response to “thank you” on one’s birthday is “happy birthday!” The implication of “you’re welcome” is that the recipient is “welcome” to ask for what has been given any time. “Happy birthday” makes clear that this is a birthday gift, not just a general kindness. Now that I think of it, perhaps since Dad always does the dishes, “you’re welcome” was appropriate in this case. Previous PostPost CancelledNext PostWho Loves Jerry? Small detail– the sweetpotato researcher is a student in my department, not my lab. I am really glad they made you happy on your birthday. That sounds like a very special birthday weekend in many ways. Happy Birthday! Thanks! You’re welcome! You ate a potato experiment!? Awesome post, Sam. You are a visionary. You forgot the part about me letting you win at Seasons. But you can’t cover everything.